To date, this is my masterpiece. 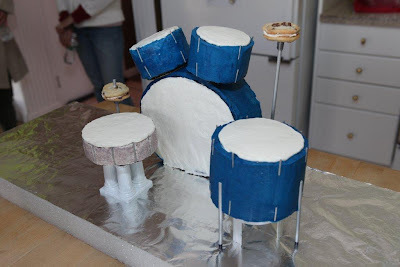 I was thinking of making a cake for Vin’s nephew’s birthday party, and since I know Jeremy prizes his drums and it’s his 10th birthday, I suggested making a cake that looked like his drum set. I think I may have been on drugs at the time, thinking I was a professional and that I could actually pull this off. I planned it all out in my notebook and bought supplies and sketched out my plans 2 weeks ago: my intention was to make all the frosting 5 days before, paint the dowels and toothpicks for the stands on Monday, make the drum stands and cut cake rounds another day, bake chocolate cake one day, decorate the next, and put together the finishing touches the morning of the party. Long story short, work has been crazy and I had to deal with a migraine this week, so I didn’t really get the chance to start anything until Friday evening. The night before the birthday party. At 9 pm. And we had to leave the house before noon on Saturday… Awesome logic and reasoning skills there, Katherine. I’m such a genius I’m sure I’ll be joining MENSA soon. The first thing I did was make the cake batter. I baked chocolate cakes with both regular and dark cocoa and they came out very light and moist. I had lots of extra pieces of cake after using circular cookie cutters to shape out parts for the cakes so I mixed some of the scraps with leftover frosting. The mash up doesn’t look pretty, but it’s portable and pretty tasty =) I let the cut out cakes sit while I made quarts and quarts of blue and white frosting. It’s pretty impressive my monster mixer withstood all this work. It looked like it got in the middle of a paintball fight. There’s spatter of chocolate cake batter, bright blue frosting, and white icing all over it. I think I’ve finally come up with an icing recipe that has the consistency I want and still tastes great. I couldn’t match the blue color of Jeremy’s drum set and this is as close as I could get after emptying out 4 containers of different colored blue food coloring. And the white icing… I’m out of lightener. I need to find this stuff in @ least pint size containers, not tiny 3 oz. bottles. And I went through a 7-pound bag of powdered sugar! After I longingly said goodbye to that last stick of butter and gingerly dropped it into the icing mix, I leveled and layered the cakes. 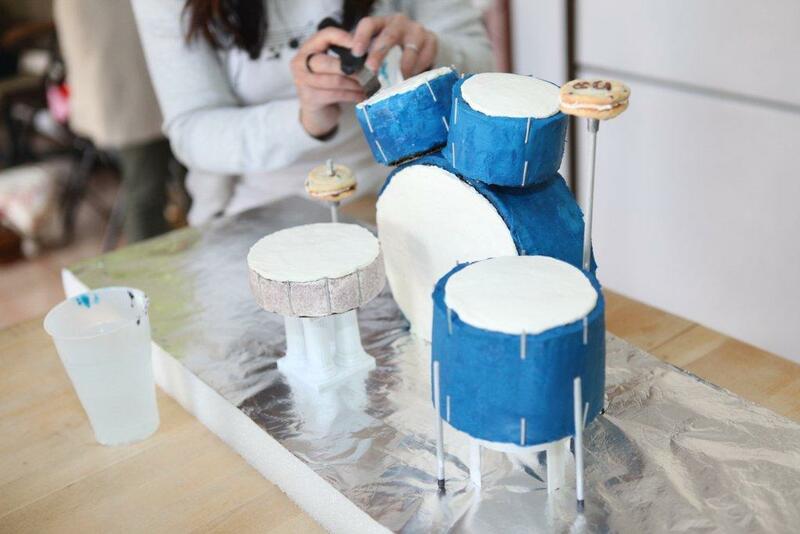 The kick drum was made of 2 8” cake rounds with frosting in-between, the 2 tom-toms above the bass drum were 2 layers of 3” cakes held together with icing, the snare was 1 layer of 4” cake, and the floor tom consisted of 3 layers. I dirty iced (as the Cake Boss would say) all the sides and put them back in the fridge for a while for the frosting to harden. Meanwhile, I cut custom cake rounds for each of the smaller drums and poked small holes in the middle for the tom-toms (these were going to be secured with dowels running through them). 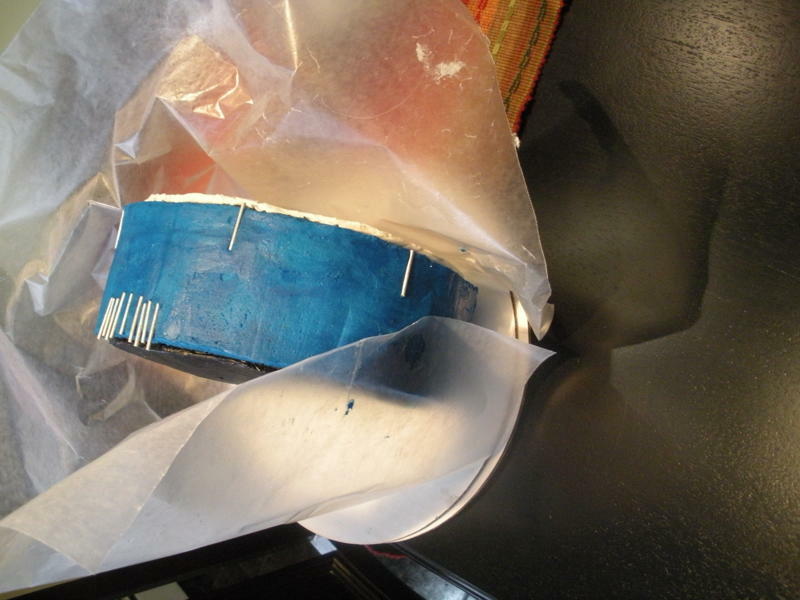 And I cut a whole bunch of the silver toothpicks I painted to be the “metal” parts of the drums. The snare drum was the first piece I frosted. Based on the pics I saw of Jeremy’s drum set, the snare was white and silver. I WAS going to make grey frosting, but being that it was already 2 am and I wanted to sleep (hah! ), I iced the side in white and dipped it in a pile of edible silver sprinkles. The next part of the drum I wanted to tackle was the kick drum. This was the hardest part since it had to sit in its side and only a small 3” x 2” area was able to touch anything. I started icing the side as I would a regular round cake, and then I did a pretty ballsy thing for the next step. Had the cake layers not been solid and firmly held together, I wouldn’t have been able to do what I did. 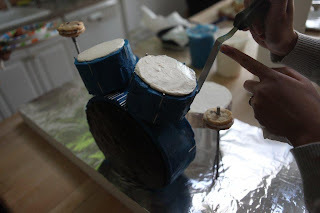 I decided the best way to ice the front and back of the drum (the flat parts of the cake) was to hold the entire thing in one hand and try to frost and smooth the top with my other hand. This could have been a terrible idea since I’m super clumsy (scroll down to read more about this awesome trait of mine), but I think my years as a waitress helped. I held the cake flat like a tray for a good 20 minutes and the front (black icing) looked pretty nice. The last 3 toms were easy in comparison, and by the time I finished the last one I got a pretty good grasp on smoothing out the frosting. When I say I made the icing smooth, I mean perfectly smooth. At first sight, Vin and some of his family thought I used/made fondant. Hah! No way. First of all, every time I’ve had cake with fondant it tasted gross. I don’t like it. Butter and sugar FTW! Second, I’ve never used it before. To be honest, the thought of using fondant scares me. I feel like someone would need to hold my hand, walk me through it and reassure me that everything would be all right. haha I’ll get to it eventually, but I still have to master buttercream. But hey, if I can already make it look as clean and smooth as fondant, there’s hope for me yet! By this time, it was about 7 am and I hadn’t slept yet. I watched the sun come up and still had a lot of work to do. Vin was a huge help and glued together the stand parts for me for the cymbal and hi-hat because I was running short on time. My original plan was to make macarons for the discs, but I didn’t have the chance to get to it, so Vin used soft-baked . They look awesome. And he helped make the base for the floor tom. I couldn’t have completed this cake without him! Unfortunately, I f*cked up all my beautiful hard work. The frosting got a little soft during the long car ride to the party, and on top of that, I’m the world’s biggest klutz. I shouldn’t be cake decorating since it’s so intricate and delicate but I do this anyway because I’m a masochist. 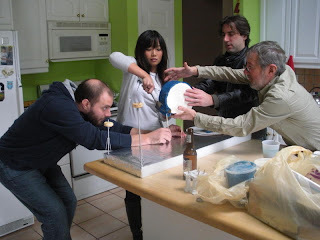 haha The fact that I hadn’t dropped anything between moving the finished cake pieces from the turntable to the fridge to the car to Vin’s parents’ then to their car and then finally brought into Jeremy’s party was a feat in itself. I put the tom-toms and snare drum in a Pyrex tray in the trunk of the car, crossed my fingers and hoped for the best. Luckily, these parts were fine. I had loosely wrapped wax paper around the bass drum and held it by the base in my lap during the car ride. Of course, things were too perfect, so something had to go wrong. Part of the icing melted a bit and the wax paper got stuck to it since it was warm in the car. No big deal, right? I expected to have to do a few touch ups when we got to the party, however I wasn’t prepared for the fiasco that lay ahead. I set the kick drum down on the counter and fixed it. But then I was super dumb. I should have fixed it on the Styrofoam base because I had to mess up my retouching work to pick up the damn thing with my hands and stick it in the dowels to hold it steady. Then the 2 smaller tom-toms… these were to sit on top of the bass drum and be secured by dowels. 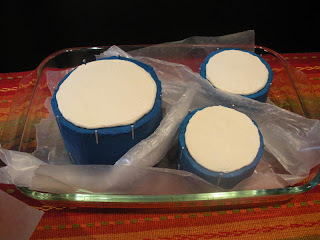 I poked holes in the cake rounds, but they weren’t big enough. I took a sharp steak knife and picked one of the small cakes up by the cardboard base so I could make the hole bigger, and then… pure chaos ensued. The cake tipped over on its side and the color drained from my face. I quickly picked it up, slid it on the dowel and smoothed out the botched frosting job as best I could. Now I had to put the other tom on the other side of the bass drum. I picked up the second tom-tom and then all of a sudden… I dropped it on its top and it also hit its side. I don’t know if it’s an inner ear thing (I’ve been known to trip on myself and lose my balance out of nowhere) or if I was just over exhausted, but the piece just fell out of my hand. And saying “F****ck!! !” in front of family at a 10-year-old’s party is something I’m not proud of, but thankfully the kids were playing elsewhere. Miraculously, the destruction wasn’t too bad. I picked up the fallen cake with my hands and poked it through the dowel. Doing damage control fixes for one little cake sitting on top of another cake without touching anything else is tough enough, but I was getting fed up with constantly ruining my meticulous work and mending all my frosting mistakes. It got to the point where I said out loud, “OhmyGodI’mneverbakingeveragain!! !” haha It was that bad. I was that frustrated. Even Vin was getting stressed with all the cake placement and logistics and I was getting annoyed @ him for being frazzled, too. 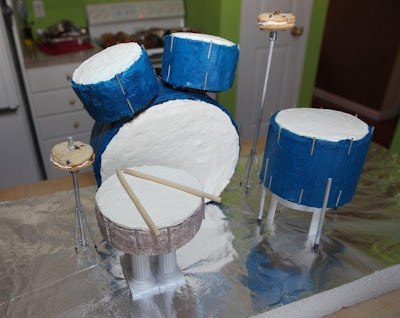 haha But the repairs were acceptable and the setting the snare and floor tom-toms on their bases were easy. The entire cake finally came together on the foam board. Not as amazing as before I assembled it, but I guess it still looked all right. And I’m proudest about how the bass drum came out. This cake was super sturdy. 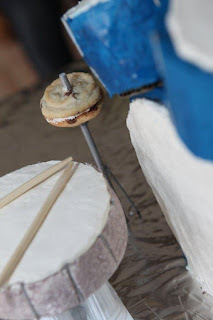 It was on its side for hours and didn’t slide or break or split in the car rides or when I moved it from board to foam base AND held up the 2 tom-tom cakes. The fact that the cakes held up for hours was a testament my planning and engineering weren’t TOO bad for my first time! I guess the only thing that mattered was that the birthday boy was thrilled. Jeremy was so excited and was so happy to show his cake to his friends. The look on his face made the effort totally worth it. Man, I wish I had a cake like that for my 10th birthday. In honor of the Super Bowl and not having orders for this weekend, I wanted to try out something different. I came across recipes for beer cupcakes and thought I should give it a shot. I love thick chocolate stouts, and cocoa would be perfect with the nice richness of Guinness (one of my faves!). I checked out a bunch of recipes and mixed and matched some ingredients and amounts (i.e., more Guinness, less milk) and upon tasting the cake batter (yeah, yeah, I know… raw eggs… salmonella… whatever. I do this every time and I haven’t been hospitalized… yet) I felt like it needed more sugar. I don’t usually use the full amount of sugar suggested in recipes, but I guess the bitterness of the beer and the tartness of the sour cream called for more sweet stuff. The cupcakes baked 10 minutes faster than stated in the recipe and I broke one open to see how it came out. The texture was just a little bit denser than my regular cakes, and the taste was pretty interesting. I could still smell the scent of Guinness and Vin said it tasted creamy. The addition of the Bailey’s frosting pulled it together really well! I also took a HUGE flower tip from my mom’s cake set and piped a big Bailey’s frosting rose on a regular cupcake for the hell of it. I didn’t have the patience to put pretty roses on the rest of the cupcakes, so I just used a star tip on the remaining 29 cakes. NOW we’re ready for Super Bowl XLV!